The Savoia-Marchetti SM.81 Pipistrello (Italian: bat) was a three-engine bomber/transport aircraft serving in the Italian Regia Aeronautica during World War II. Despite being too slow to remain competitive as a bomber, it was one of the most flexible, reliable and important aircraft of the Regia Aeronautica from 1935-1944, and adapted to second-line duties in performing a wide range of tasks. The SM.81 was a militarised version of Savoia-Marchetti's earlier SM.73 airliner, having cantilever wings, three engines and a fixed undercarriage. The origins of this version were in pursuit of the interests of Italo Balbo, a brilliant exponent of the Fascist regime (but nevertheless "exiled" in Libya by Mussolini), who required a fast and efficient aircraft that was capable of serving the vast Italian colonies in Africa. The SM.81 had wings that were roughly similar to those of the double-fuselage SM.55, and identical to those of the SM.73, but had a much simpler fuselage. Around six months after the SM.73s first appearance, the SM.81 prototype (MM.20099) first flew from Vergiate, near Varese, on 8 February 1935, controlled by test pilot Adriano Bacula. The first serie, ordered in 1935, was for 100 aircraft and was quickly put into production as a result of the international crisis and the embargo caused by the war in Ethiopia. The first examples were sent to 7 Wing, Lonate Pozzolo. Although it was quickly superseded as a front-line bomber, the SM.81 continued to serve as a transport aircraft by virtue of its wide fuselage, which allowed it to accommodate a wide range of armament. Apart from its speed, it was generally superior to the SM.79 Sparviero as a bomber and multirole aircraft. The SM.81 was a robust, three-engine monoplane, with a fixed tailwheel undercarriage, with the mainwheels enclosed by large spats to reduce drag, and had a crew of six. The aircraft was of mixed construction: the fuselage had a framework of steel tubes with a metallic-covered aft portion, while the rest was wood- and fabric-covered. It had a relatively large fuselage, an unnecessary characteristic for a bomber, which determined its future as a transport aircraft. Since the engines were quite small, the fuselage did not blend well with the nose engine, even less so than the SM.79. Many windows were present to provide the fuselage interior with daylight, giving the impression that it was a passenger aircraft. The all-wooden wings had three spars to provide the necessary support, whereas the semi-elliptical tail surfaces were fabric-covered metal. The pilot and co-pilot were seated side-by-side in an enclosed cockpit, with separate cabins for the flight engineer and the radio-operator/gunner behind the cockpit. The bomb bay was behind the cockpit, together with a passage which linked the mid and aft fuselage, where there were three further defensive positions. The bombardier's position was located just below the cockpit, in a semi-retractable gondola, and differed from that of the SM.79, being both larger and in a location which was more favourable for communicating with the crew, and provided excellent visibility thanks to the glazed panel. Both this position and the cockpit had escape hatches, but for normal entry and exit there was a door in the left, mid-fuselage, and one in the aft fuselage. Equipment included an RA 350I radio-transmitter, AR5 radio-receiver, and a P63N radiocompass (not always fitted), while other systems comprised an electrical generator, fire extinguishing system, and an OMI 30 camera (in the gunner's nacelle). The aircraft, having a large wing and robust undercarriage was reliable and pleasant to fly, and could operate from all types of terrain. It was surprisingly fast for its time and given the power of its engines, especially compared to the similar Junkers Ju 52. It was better armed than SM.79s, but the increased drag combined with the same engine power reduced the maximum and cruise speeds, as well as the range. No armour was fitted, except for the self-sealing fuel tanks. The SM.81 was equipped with six machine guns providing a heavy defensive armament for a 1935 aircraft. Two powered retractable turrets, one dorsal (just behind the pilot's seats) and one ventral-aft, were each fitted with 7.7 mm (0.303 in) Breda-SAFAT machine guns, while single 7.7 mm (.303 in) Lewis Guns were mounted to fire through lateral hatches. The turrets were rotated by a "Riva-Calzoni" hydraulic system while the gun's elevation was manual, and manual back-up mechanisms were provided for both the retracting and rotating systems. Once retracted, only the upper part of the turret was visible, with the gun barrels positioned vertically, one aft of the other to reduce drag, and gave the impression that the aircraft had additional antennae. Given the SM.81's cruise speed of around 270 km/h (170 mph) and the presence of a massive fixed undercarriage, the aerodynamic gain was relatively small. The ventral turret was operated in a different fashion to those fitted to other aircraft where the gunner occupied the ball- or dustbin-shaped structure; instead, due to lack of space, the gunner crouched in the fuselage with his head down inside the turret. This proved to be not very effective as were most ventral turrets, and they were not fitted to further Savoias, although Piaggio fitted a dustbin-style turret accommodating the gunner to their P.108. Both flanks were covered by one single and one twin gun installation. Initially six 7.7 mm (.303 in) Vickers machine guns were fitted, but later replaced by reliable, if not very fast-firing models made by Breda, together with 500 rpg. The bomb-release mechanism was located on the right side of the bombardier's position. The SM.81's defensive armament was better than its successor, the SM.79, and even the SM.84s, but still insufficient when faced with modern enemy fighter opposition. It was also capable of carrying a greater bombload than the SM.79, due to its wide fuselage. Alfa Romeo 125 RC.35, 432-507 kW (580-680 hp). 192 built. Gnome-Rhx�ne 14K, 485-746 kW (650-1,000 hp).96 built. Piaggio P.X RC.15, 501-522 kW (670-700 hp) - 48 built. Piaggio P.IX RC.40, 507 kW (680 hp) - 140 built. Alfa Romeo 126 RC.34, 582-671 kW (780-900 hp), also fitted to early versions of the SM.79. 58 built. In addition, one aircraft, the SM.81B, was built in a twin engined configuration, powered by two 627 kW (840 hp) Isotta-Fraschini Asso XI inline engines and a streamlined, glazed nose. It had inferior performance to the three engined versions and was not taken further. 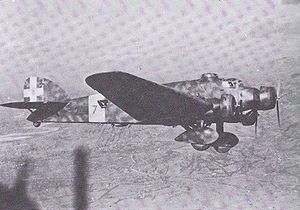 The SM.81 first saw combat during the Second Italo-Abyssinian War, where it showed itself to be versatile serving as a bomber, transport and reconnaissance aircraft. SM.81s also fought in the Spanish Civil War with the Aviazione Legionaria and were among the first aircraft sent by the fascist powers to aid Francisco Franco. Despite their obsolescence, by 1940, when Italy became involved in World War II, more than 300 (290-304 depending on source) SM.81s were in service with the Regia Aeronautica. The first Italian aircraft to enter action in East Africa were a pair of SM.81s. On 11 June 1940, one of them attacked Port Sudan and the other flew a reconnaissance flight over the Red Sea. That same night, three SM.81s took off to bomb Aden, but one turned back, and one of the other two hit a hill near Massawa while trying to land. Its low speed and vulnerability to fighter aircraft meant that during daytime it was restricted to second line duties, finding use as a transport. At night the SM.81 was an effective bomber, particularly in the North African theatre. Anti-ship actions were also carried out, but without significant success. 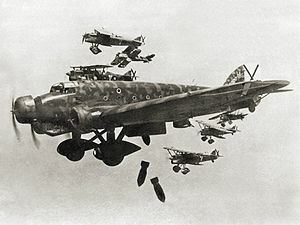 Most SM.81s were withdrawn by the time of the Italian armistice of 1943, though some remained in service with both the Italian Social Republic and the Italian Co-Belligerent Air Force. Several examples survived the war and went on to serve with the Aeronautica Militare Italiana, but by 1950 these had all been retired. SM.81s serving in Ethiopia had the "white avorium" markings applied to distinguish them in SAR missions. The normal camouflage pattern was yellow, green and brown mimetic. The all-over dark olive green scheme was introduced later, when the aircraft were used only in transport missions. Three-engine bomber, transport aircraft, 535 built. Experimental twin-engine prototype, one built. Chinese Nationalist Air Force received three aircraft, all were lost in training accidents in February 1938 at Yichang. Aeronautica Militare Italiana operated this type postwar. Passingham, Malcolm. "Savoia-Marchetti SM81". Aircraft Illustrated, May 1977,Vol 10 No 5. pp. 182-187.